“We know our people, we trusted our people, we organised our people and the results are in front of everybody”. 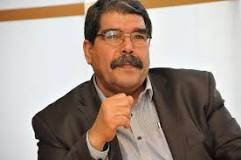 Salih Muslim co-chairman of the PYD (Democratic Union Party), the dominant political party in Rojava (Syrian Kurdistan), last night addressed hundreds at a packed meeting in the Palace of Westminster, London. Convened by the Centre for Kurdish Progress, the platform tackled the theme ‘Kurds in Syria: From Denial Toward Self-Ruled Governance Model’. Mr Muslim, the keynote speaker, said that ISIS is effectively a tool for other powers who oppose Kurds’ aspirations and “cannot accept the social democracy” now established in Rojava. The men and women fighters of the YPG and YPJ were well organised, tied to their land and their principles and “the organised people were able to defeat such a brutal force while the nation state armies of Syria and Iraq could not stand against them”. “We believe the nation state is the main source of problems in the Middle East” he said. All the region’s states hold a mix of nationalities and Rojava – with its social contract guaranteeing the rights of all the components of society – can provide a model for the rest of Syria and beyond. Mr Muslim said all the peoples of the area – Kurds, Arabs, Assyrians, and so on – had been involved in electing 101 representatives who had decided on Rojava’s canton structure and encouraged the self-organisation of the population. “We trusted our people, and they are doing well”. He stressed the importance of equal rights for men and women, with quotas ensuring at least 40% women’s representation in all Rojava’s institutions. Mr Muslim spoke of the young people “considered to be Kurd and Sunni” who have helped protect churches in Assyrian villages under ISIS attack. “We are proud of them”, he said. He also lauded those internationalist volunteers – Ivana Hoffmann, Ashley Johnston and Konstandinos Erik Scurfield: from Germany, Australia and the UK – who recently sacrificed their lives in Rojava, fighting and dying alongside the Kurds and others for “humanitarian values”. Mr Muslim emphasised the continuing difficulties faced during this “hard war”. Rojava needs modern weapons, medical supplies and the means for reconstruction. 80% of Kobani was destroyed in the fighting. 50,000 Kurds had returned to the city but have no homes. There is everywhere shortages of electricity and water. “We are in the frontline”, he said. “We need to be supported by all the pro-democracy powers and organisations to defeat this brutal organisation and this jihadist mentality” that slaughters and enslaves. “We promise we will fight to the end to defeat ISIS everywhere”. Syrian Kurdish women representation/contribution is not strong enough in the political process in Syria. The living plight of Syrian Kurdistan must improve. More funds need to be invested on education, development, democracy. A new geographic map has been designed for Kurdistan in 2020. It engulfs South and parts of North Kurdistan ( Turkey). Will be available on Google very soon.